I just bought a recumbent trike, and plan to do a fair amount of long-distance traveling on it, to the point that a dynamo hub seems like a really good idea. I was going to put a dynamo hub on one wheel in the front, but I think it would be annoying to have one wheel dragging more than the other, so I'm considering putting a dynamo hub on both front wheels (speed is not a concern to me, but comfort and controllability definitely are). Ideally, I'd like both dynamos to supply the same storage and electricity delivery system, but with A/C current, directly hooking them up to the same source seems like it would be a bad idea. Can I just slap some bridge rectifiers on the output cables and hook them into the same input on the storage device? Do I need to get more clever? Is this risky at all? This is going to be difficult. I assume you have a tadpole or delta and you're trying to drive the dynamos off the paired wheels - and not the single (drive) wheel. The problem is that the paired wheels often use single-sided (aka wheelchair) hubs and most dynamos are made with standard hubs that are designed to be supported on both sides. Schmidt SON are (apparently) the rare counterexample that have single-sided custom versions. Problem 2: Dynamos have a "direction"
Furthermore, dynamos are often built to rotate in one direction. Rotating them the other direction will lead to fiddly bits falling out of them. That's a problem because almost all dynos have the wires coming out one of the sides (usually the drive side) - and that'll mean that for the right side wheel, the wires coming out the right side will be unsupported. So in practicality, having a right-side dyno might be very hard. Dynamos have drag even when non-powered. It varies from about 3-5 watts which is negligible especially on a commuter bike, but when you have two of them, you're doubling to 6-10 watts of constant drag, which is felt more on a trike. While you'll have twice as much current, you'll also at least double the amount of power you're losing to inefficiencies. You can rectify both using bridge rectifiers to get DC from AC but you'll lose some voltage (and thus power) going through the bridges. The problem is going around corners or in a circle, one hub will be putting out a higher voltage than the other and the lower voltage one may not be operating at max efficiency depending on your circuitry. The bridge rectifiers will prevent backfeeding but you're increasing the inefficiency of the system. On my commuter (bicycle), a front dynohub is constantly charging a LiPo whether the lights are on or off. This is because my cheap Sanyo hub has drag regardless of whether it's under load, so I might as well as use the drag. I rectify and then pass it through a buck-boost to charge up a LiPo which then I boost to charge my cellphone when connected. You'll want parallel buck-boost circuits to avoid the problem of unequal power output listed in Problem #4 above. You're on a trike and so weight is obviously not important to you (sorry, couldn't resist the dig). So just get a small 10,000 mAh battery pack and/or solar charger and use that. It's better than the constant drag you're imposing. Get just one really high quality Schmidt SON dynamo and put it on the left side paired wheel if possible. Why the left? If you’re in a country where you drive on the left (most the world except UK and Japan) then the road slightly slopes to the right for drainage. You're already needing to constantly turn a bit left to maintain a straight line and the unequal drag on the left will act as a slight trim and be felt less. The Schmidt SON dynos have been measured to have the lowest amount of drag when unloaded. Peter White says they have a tadpole compatible Schmidt SON for special order. I have no affiliation with PW except for a single order I placed a decade ago. You actually need to be a bit careful. 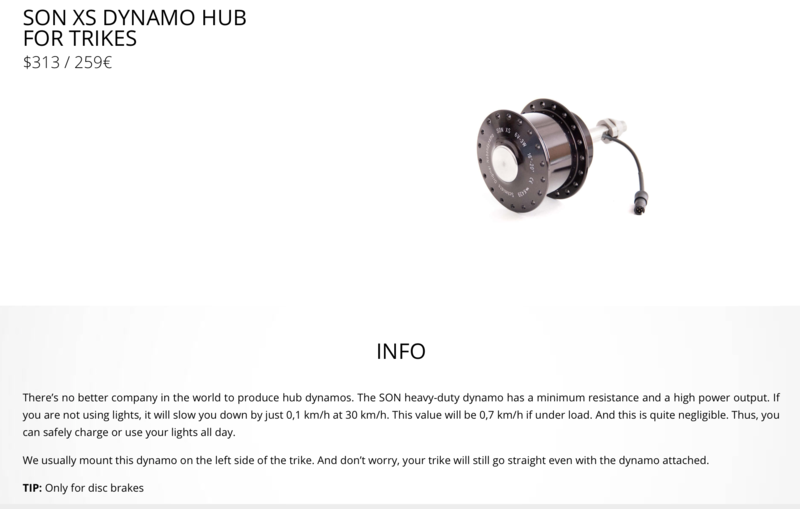 With most hub dynamos the case is not neutral but carries the voltage of one of the wires, sometimes the hub shell together with the axe replace one wire. A notable counterexample (with isolated hub shells) are SON hub generators. You would also like to run the generators in parallel (after rectifying). Also some hub generators might also be voltage regulated - so as not to burn your old incandescent bulbs on steep descents. Not the answer you're looking for? Browse other questions tagged recumbent tricycle dynamo-hub electric-power or ask your own question.